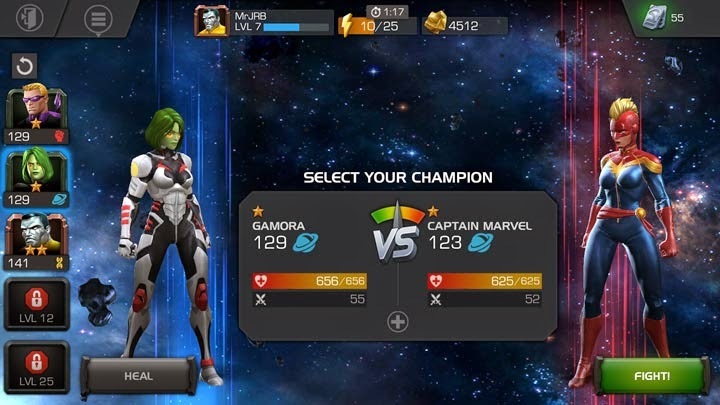 Coming across Marvel Contest of Champions I was both surprised and disappointed. The game does have some really good merits, however, the downsides are pretty heavy and tip the balance more towards that bad side. What can you really expect for a game that starts with the need for an always on internet connection? Right away you get the story of Kang the Conqueror attempting to conquer the universe and "The Summoner" (The Player) attempting to thwart him in a strange tournament of heroes and villains. That isn't too terrible, the story is both extremely generic, but does have some gems of dialog to keep it somewhat interesting. The story campaign, baring little resemblance to the same named comic book series years ago, is divided up into 3 acts of 4 chapters and 6 missions. The monotonous tone has been set. By the end of the first chapter I had become so bored with the simple tap and swipe controls of the roster I had developed I didn't even want to continue. Slightly further along I found a ridiculous difficulty spike putting any kind of progress right behind a heavily encouraged gamble of a paywall. The lack of depth of this game is a huge hindrance, blocked just beyond the paywall barrier that is common to the Freemium games arena. 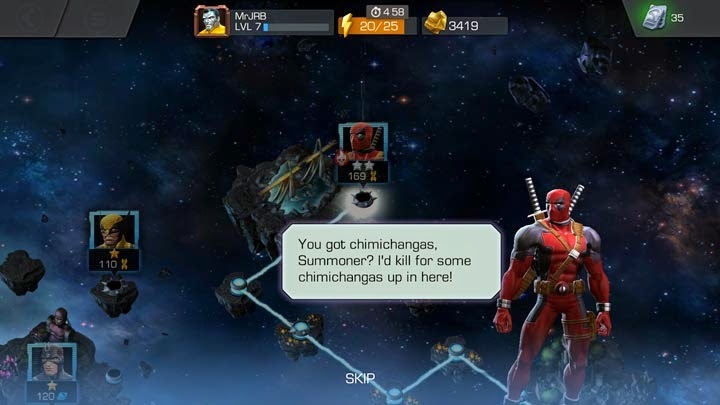 Players are encouraged to spend money to unlock movement energy to play for longer, to purchase a myriad of crystal types to gamble at the chance of unlocking a new hero (with a high chance of also getting ones you already have) or items to level characters up (but they'll still fall behind in stars as the game progresses), and the ridiculously escalating difficulty nearly necessitates it. All of it designed to make players want to buy more- but the problem is that these are all actually things that made me dislike the game more. It builds a distrust because I know it's made not to be fun or fair, but rather to encourage spending, like the coin-operated quarter-muncher arcades from years ago. 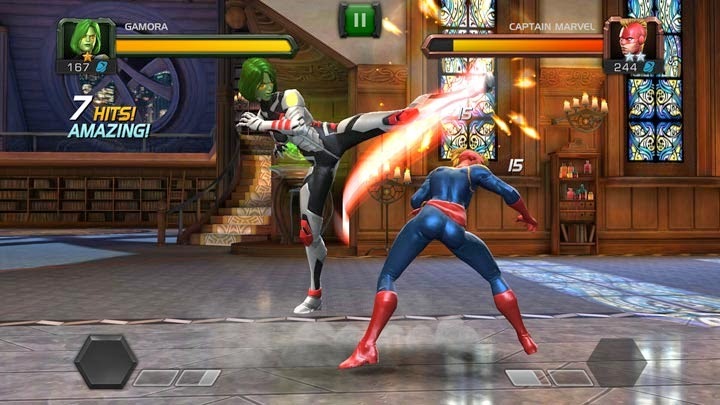 I want to buy or play as specific characters, like Marvel Heroes 2015 allows for, not be forced into a game of chance that continually gave me the lowest 1 star versions of characters I already had. Getting to gameplay- there's a slew of characters that break down into 4 categories, and sadly- that leads to essentially amounts to simply just reskins of the same move sets which in turn leads to a lot of repetitive combat. 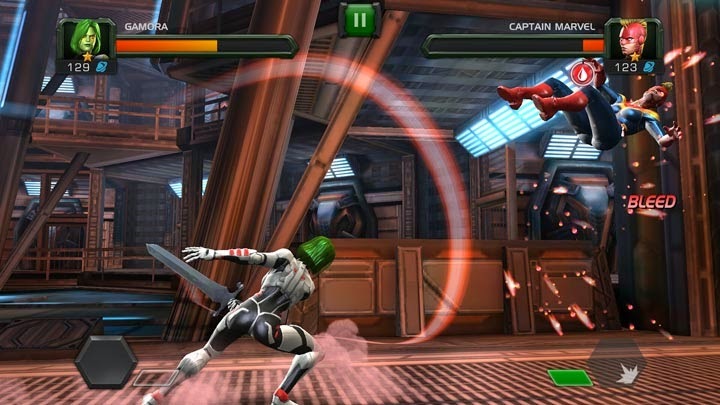 It is nothing near to it's spiritual predecessor Marvel vs. Capcom. The set up of 1 versus 1 play could've been great, but the execution of it is so bad. Each character falls into one of the 4 categories and you just chose the highest level one that is better in the form of a Paper/Rock/Scissors-esque system. As mentioned before all the characters felt nearly identical, and the tactics that should be there just aren't. The game loses its already minimal luster very quickly, especially if you repeatedly get characters you don't like as your roster. To be a little more fair, there is still a lot to like here. Playing PVP is fun, although you are actually playing against an AI version of other players as far as I could tell. The controls are as simple as can be and the navigation menus are truly great. The art and music were top notch for a phone game- very reminiscent of the Disney Infinity Marvel game. Honestly, if you don't mind playing a free game you can whittle away at over the course of weeks I'd say give it a go. Hell, if you are a Marvel fan I'd say give it a couple days of play just for fun. The game isn't amazing, but it'll pass the time for very short spans. This is a case where making a solid game to be sold may have been better than the "Free-to-Play" model they created.